The Kanga is the “everything” cloth of Africa. They are used as skirts, dresses, head wraps, baby carriers, ground cloths, wall decorations, table cloths, and when worn out, cleaning cloths. Only your imagination limits the use of these simple, African design lengths of fabric that are made of cotton. The panel is approximately, 42″ x 60″. The panels are cut leaving two salvage edges and two rough edges. Sold as single panels. 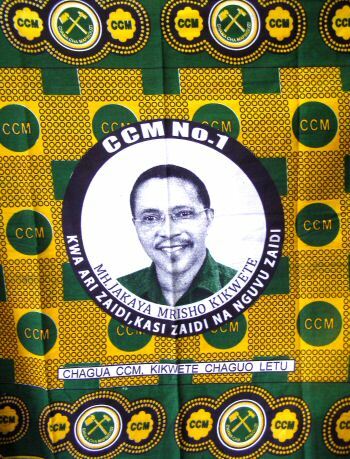 Jakaya Mrisho Kikwete (born October 7, 1950) is a Tanzanian politician, the fourth and current President of the United Republic of Tanzania. The words on the bottom translate to “With the will to succeed faster and more powerfully”.